Surrey Roofing Pro's - The Best Roofers in Surrey, B.C. Surrey Roofing Pros is the most-reliable and experienced roofing company in the Surrey, B.C. area for roof and gutter installation and repairs. The Sultans of Shingles, the Guru's of Gutters, the Royalty of Roofing (ok, maybe we've spent too much time up on roofs). We have been providing home and property owners with our quality service for years. We believe in delivering the best roofing service to our customers. We are committed to making sure you are happy with the job we perform. Call us if you need a new roof that is durable and will last for years to come! We do not strive for big business. We strive for good business. Good business is what makes repeat customers and referrals. Our roofers are highly trained, and our quality control and quality assurance is second to none. With us, we will take care of your installation or repair project from beginning to end, giving you top-notch service and support throughout the entire roofing or gutter installation process. We are devoted to customer satisfaction. With every project we undertake, we give it the utmost care, time, and unique consideration. Regardless if it is a small or large job, we deliver the highest quality of work. Every customer receives top-rated work at affordable pricing. Our core philosophy is to bring value to the marketplace. We accomplish this by following the golden rule of providing our services as we would want them provided to us. Our strong commitment to excellence can be found in every aspect of our business, including hiring quality roofers, using superior products, and guaranteeing brilliance in our workmanship. We pride ourselves in giving homeowners in Surrey, BC affordable roofing and gutter installation and repair solutions. If you are looking for a roofing contractor who delivers first-rate craftsmanship, reach out to us. If you want the attractive roofing structure you have always dreamed of, contact our experienced roofing contractors at Surrey Roofing Pros. Our roofers are insured and licensed, guaranteeing the safety and protection of our customers. To get you ready for your roofing project, our contractors spend the right amount of time with you as we assess your roof and create an individualized plan for you. We offer a wide variety of roofing services, so we feel quite certain we can handle your simple or complex roofing project. The condition of your roof and gutters has a direct impact on your quality of life and the overall value of your Surrey, BC area home. Unfortunately, roofs and gutters do not last forever. We will always offer reasonable price and will not forgo workmanship or slight a job just to give a low rate. If your roof is leaking, or you have loose shingles, get in touch with us right away. We are a commercial and residential roofing business committed to integrity and professionalism. We are locally owned and operated, so we know what type of roof it takes to keep your structure protected. We provide fast and accurate service for all of your roofing needs. As your Surrey roofing contractor, we come to your property, without delay, and give you a candid, straightforward assessment of your roofing requests. Our crew will go the extra mile, communicating with you consistently during your roofing project to make you feel more comfortable. We are happy to answer any questions you might have, as we want you to be knowledgeable about the innovative techniques we utilize for your new roof or roof repair. Once your roofing plan is created, our experienced roofers will perform the work quickly and safely. Our objective is to serve you with honesty and professionalism by providing customer satisfaction. We are re-roofing specialists and experts with all types of roofing. We have earned our reputation one customer at a time and will treat you and your home respectfully. We are often called out to look at a roof problem, only to find out from the customer that the same problem was previously repaired by another roofing business. We are the best in our field, and we get it right the first time. When we function as your roofing contractor, the next time you call us is when you need a complete re-roof. At Surrey Roofing Pros, we believe in providing our Surrey, BC clients with the best roofing services in the area. What sets us apart from our peers are our years of experience in the industry. Not only do our roofers possess the skills necessary to do a good job, but they consistently stay abreast of the latest technological advances. There is no project too big or small for us. Moreover, we love usual or difficult roofing projects. We take pride in providing exceptional craftsmanship the first time around. You will find our staff to be reputable, qualified, and professional. Our high level of service is what has made us the leading name in roofing installation and repairs in Surrey, BC and the surrounding areas. Our contractors can handle any type of roofing service you need. We value you as a client, and we take your opinion and budget with total seriousness. We only employ roofers that hold the same values that we do, which is putting the client needs above all else. First and foremost, we are committed to you and your commercial or residential roofing requests. We make it a goal to provide affordable, world-class roofing options and results that exceed your expectations. We are here to give you quality results for your complete satisfaction. We built our company on a strong base of honesty and dependability, compelling every client to be dealt with appropriately while receiving roofing services from us. We want you to get the level of service that you deserve every time you hire us. If you are looking for a Surrey, BC roofing business that will treat with respect, call us today! Whether it is a new roof, a repair, or a leak, we have got you covered. We believe our success is due to our commitment to being crazy about quality. 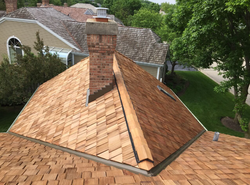 We use only the finest materials, employ the most skilled roofers, and back it all up with a management team devoted to integrity and first-rate workmanship. We know how to get the job done accurately each and every time. If you are looking for a leading quality Surrey roofing company, you have come to the right place. We deliver home and business roofs built to last. We use only top-quality materials to install, repair, or maintain your residential or commercial roof. We have been in the roofing business for many years, and we have built a firm reputation in the Surrey, BC community. Having installed a huge number of new roofs, we are an educated team that works hard to satisfy you. We care about the satisfaction of our clients. We know that your roof is always going to be your primary protection against the Surrey weather. This is why your roof needs to be made with the right material, strong, and well cared for. The durability of your roof depends on a number of factors, such as the type and quality of roofing material. With our expert home roofing service, we help you choose the right roof for your personal tastes, your roofing style, and the technical roofing options that will protect your home or business. We know that your residence or business is an investment. Instead of having to talk with several Surrey roofing contractors, we can handle your entire roofing project. We handle not just the layout and the design, but we also ensure the job is completed to your satisfaction. Every roofer that works for us has the capabilities, knowledge, and skills necessary to deliver quality work every time. Having a good, solid roof on your structure adds to its value and beauty. Good roofing will not only increase the value of your property, but with professional roofing services, you will not encounter the same problem again for many years. If you are looking for a Surrey, BC roofing business that will make your home or business look good and give first-rate protection, look no further than Surrey Roofing Pros. When you need a skilled roofing contractor, we possess years of experience and vast knowledge of the best roofing contractor’s practices, guaranteeing your roofing project is managed accurately. What we say we are going to do for you is exactly what we do. You will find us trustworthy and efficient, and we want to be your first choice when you need roof installation or repairs. We are very experienced in commercial and residential roofing, and we will offer you a variety of roofing options. Let us help you get your roof and gutters looking and functioning their best. If you are in need of expert roofing services, arrange a consultation with Surrey Roofing Pros!